It has been a 100 years since Our Lady’s warnings and guidance to the world. Yet, most of the world and the faithful simply haven’t heeded Our Lady’s instructions. We will pray for the conversion of others but we neglect to look into ourselves. The proof is blatantly obviously as over the past 100 years since Her warnings things have gone from bad to worse. Churches, monasteries and convents have closed. Between 70 – 80 percent of people who say they are “Catholic” don’t even attend Church any more and the few that do frequent Mass, don’t participate in the sacraments and if they do, sadly most don’t participate in them properly by having true sorrow for their sins. The loss of souls is staggering. We simply won’t obey Her. Our Lady has given us wonderful guidance to spur us into action to amend our ways, we just need to listen. 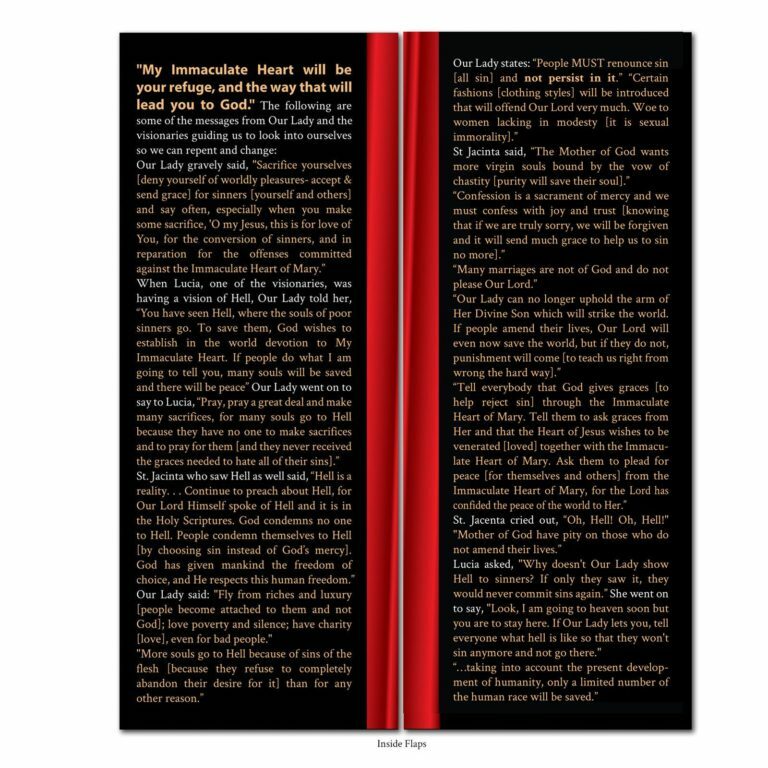 Instead of providing someone with a book with countless pages to read to learn Her messages, this one brochure can work to save their soul by providing enough information for them to heed her warnings and repent and change. Yes, it is we, the faithful, that need to change…not just those who have left the Church. We don’t want to be like the Pharisee, full of pride, not looking into our own souls and neglecting to love God by not obeying God or His Mother. Eternity is forever!If we neglect in telling people there are consequences for our unrepentant sins, they will simply have no motivation to change and will die. We need to tell the world what Our Lady has said. The people of the Church might know Our Lady came to Fatima but hardly anyone actually knows what she has said. 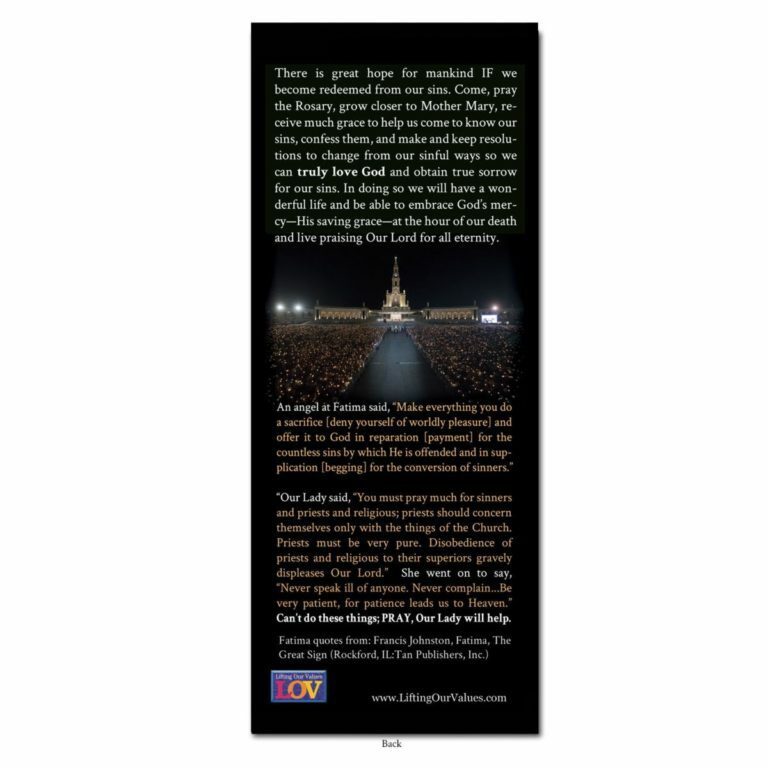 This tragedy can be easily repaired by sharing this brochure with all of the faithful. Why are we going to Our Lady for help? The Blessed Virgin Mary always leads us to Our Lord, and wants us to clearly understand she is here to intercede in prayer on our behalf so we can obtain the grace we need to help us in this life and to guide us to Heaven. To prove her love for us, the Mother of God visited Lourdes, France in 1858 and gave us healing waters that have cured thousands afflicted with aliments. In doing so, she is emulating Our Lord. When Jesus came and lived among us, to show His love and prove He was the Son of God, Jesus healed countless of their infirmities too. Of course that wasn’t Jesus’ main mission on Earth. His main mission was to take away our sins by His suffering, death and resurrection as well as to teach us, who fall into sin after baptism, the Way to eternal life through loving God by obedience to the Word. Since Our Lady perfectly follows God, we know her main mission isn’t simply to heal us from our worldly problems but to guide us to her Son so our sins can be forgiven and we can be saved. Amongst the many approved apparitions Our Lady has made in order to guide us to the Lord, in 1917, the Blessed Mother visited three children in Fatima, Portugal and performed outstanding miracles in front of tens of thousands of people and made prophecies to prove her messages to be authentic and serious. The profound messages she gave us are meant to transform our lives into holiness, in order that we might learn how to truly love God, obtain forgiveness of our sins, and ultimately be saved. If we only knew how much she helps us we wouldn’t let a day go by without following her guidance or praying the Rosary. Our Lady wants us to pray the Rosary, for her help, not necessarily for our worldly desires since none of those worldly things really matter if we don’t have saving grace for eternal life. Eternity is forever. Our sins are killing us. “What does it profit a man if he gain the whole world and suffer the loss of his own soul?” (Matthew 16:26). Our Lady clearly says we need to Pray the Rosary so we can learn our sins, repent of them and develop effective resolutions to stop offending our God who is “already too grievously offended.” From God’s great mercy, He sent His mother to us. Do we really hear what the Mother of God is saying—are we truly listening? If we aren’t truly working hard to amend our ways, because we don’t want to offend God, then how much love do we have for Our Creator? God wants us to love Him with “ALL of our heart” (Luke 10:27). This is what He said is needed for eternal life. No matter how much we do for God, we aren’t saved by our works; we are saved by His sanctifying grace, and we are lost by rejecting God’s mercy by LOVING ONE SIN (refusing to amend any sin). We must have a “resolution not to sin again” (CCC #1451). If we choose to love any sin, we reject God’s love (mercy) and are lost for all eternity. As St. Thomas Aquinas explains a “sin generically venial becomes mortal,” when someone “fix[es] one’s end in that venial sin [has no desire to amend].” We must honestly desire to “sin no more” (John 8:11), so we can embrace mercy and not reject it. 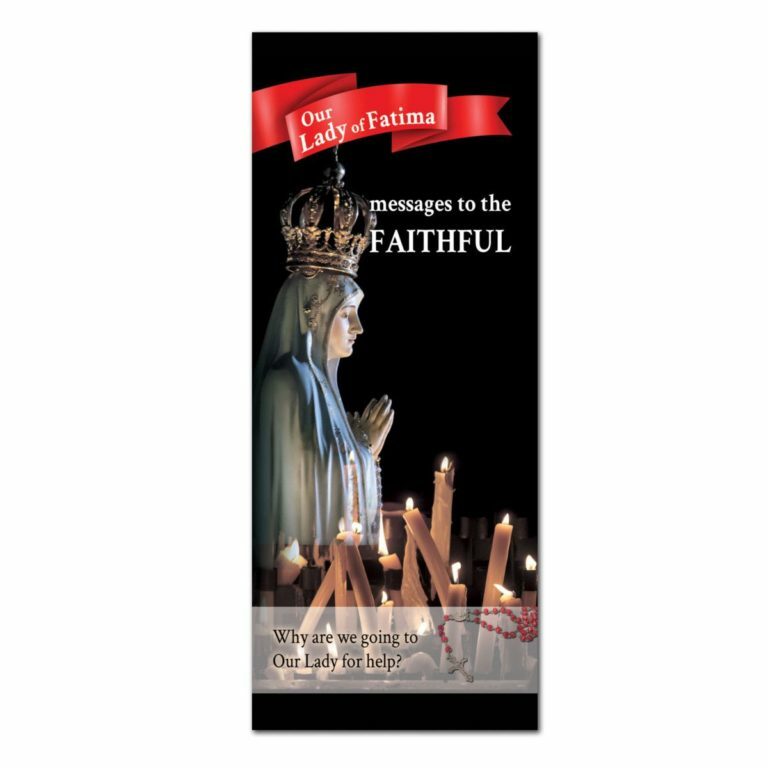 Our Lady warns us—the faithful—“The sins of the world are very great … If men [us] only knew what eternity is, they [we] would do everything in their [our] power to change their [our] lives.” But sadly for the most part, the devil has captured the faithful, and we aren’t honestly looking into ourselves and are not growing and growing into greater and greater holiness, which proves our lack of correct repentance and true love for God. Sadly, most are pretty much the same person today as they were yesterday, still with the same anger issues, complaints (ingratitude), worries (lack of trust in God) and other sinful behaviors that bring a lack of God’s peace because of our unchanged, unrepented sins. Those who are properly loving God and obtain His mercy (help & forgiveness) don’t want to offend Him at all, repent and CHANGE…not just with the “big” sins but they don’t want to offend God at all and work hard to strive to come “to holiness: ‘Be perfect, as your heavenly Father is perfect.’” (CCC #2013), as God has commanded of us. They don’t try to justify their sins as not actually sins or decide that they are “no big deal,” nor is their change towards perfection slow or lukewarm, no, it is strong and consistent from their strong and consistent faith, obtained from their real desire to not offend God. We can’t ignore God (any of His commands) and still say we are sorry for our sins, when we aren’t even honestly trying to obey…that is false sorrow and no forgiveness is received. His mercy only desires a truly sorrowful heart for all of our crimes against Him, but sadly most simply don’t have it. There is great hope for mankind IF we become redeemed from our sins. Come, pray the Rosary, grow closer to Mother Mary, receive much grace to help us come to know our sins, confess them, and make and keep resolutions to change from our sinful ways so we can truly love God and obtain true sorrow for our sins. In doing so we will have a wonderful life and be able to embrace God’s mercy—His saving grace—at the hour of our death and live praising Our Lord for all eternity. “Our Lady said, “You must pray much for sinners and priests and religious; priests should concern themselves only with the things of the Church. Priests must be very pure. Disobedience of priests and religious to their superiors gravely displeases Our Lord.” She went on to say, “Never speak ill of anyone. Never complain…Be very patient, for patience leads us to Heaven.”Can’t do these things. PRAY, Our Lady will help.